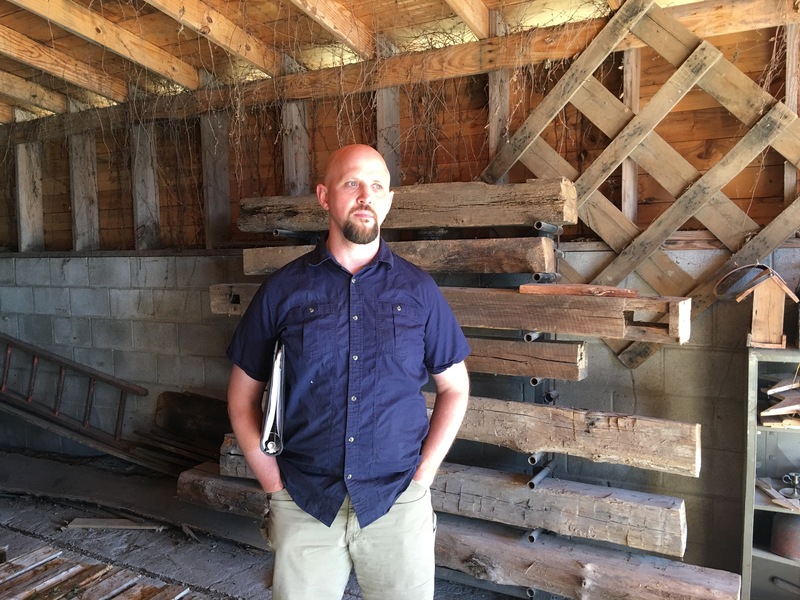 Derek Guyer runs Kentucky Reclaimed, a wood working operation in Allensville, Kentucky, population 157. In one part of the business, he turns old tobacco barns into picture frames, Christmas angels, bookshelves, mantle pieces, and tabletops, selling to buyers around the country online. In the other, he collects lumber that has what some consider blemishes, lumber that mainstream stores won’t push, lumber with its own look and feel and stories. Kentucky Reclaimed occupies what used to be the Kentucky Woven Label Company. It sits behind Guyer’s house, where his wife works inside, homeschooling their six children. It sits beside a Baptist church. The first part of our interview with him back in March (conducted by Sam Ford, Grant McCracken, and Josh Poling) ran in familiar directions. Guyer prizes lumber that carries a record of its origins and the history it helped construct. Cabin-grade lumber is a triumph of the particular over the general. It defies the machine-made perfections of industrial capitalism. Guyer is a Christian. His father was a preacher. His mother was a teacher. He worked in the ministry for years. And it became clear to us over the course of the conversation that his work today running Kentucky Reclaimed was, to him, an extension of that ministry. That kid’s struggle with parental expectation are familiar to Guyer. He was told his creativity didn’t sit well with his Christianity. He persevered. He joined the Screen Actors Guild and had a small role in Robert Altman’s Cookie’s Fortune. As a barbershop music performer, he won two district championships and placed in international competitions. He and some family members released multiple a cappella albums. In recent years, he illustrated a children’s book, and he gained attention by creating art through leather etchings. There’s a “takes a village” theme to Kentucky Reclaimed. What Guyer does for others, others have done for him. He owns this business in part due to the generosity of his workshop’s previous owner. And what brought his business to life was a win at the Wishing Well competition run by Josh (our guide for this journey throughout the region). There appears to be a pool of generosity here with Kentuckians both giving and taking. For Guyer, management is an act of service. His business model is a moral model. He takes a kind of Frank Capra view of things. There, for want of Guyer’s intervention, goes someone for whom things could end up badly. For Guyer, artisanal work is an opportunity of self-discovery and self-expression. It’s part of a person’s spiritual journey. Artisanal work saves souls, your own and others. Guyer doesn’t shrink from the idea that the way he thinks about and runs his woodworking operation is a kind of ministry. He talked frequently about all the ways his wife and children took part in the business and the fluid interplay that exists between family life and education in the house and the artisanal business running out of the back yard. Family and employees; work and play; business enterprise and spiritual growth—these all intertwine at Kentucky Reclaimed. Capitalism usually exhibits a certain glassy neutrality. Producers and consumers like to keep things simple. An exchange usually scorns the idea of moral intervention. Economies work best, the theory says, as a formal movement of value. Not extra-economic knowledge or interaction is called for or, in some cases, forgiven. Inside the organization, the idea is that you manage people for utilitarian purposes, not spiritual ones. Sure, giving someone a job will have salutary effects. But this good is a byproduct of employment, not its purpose. Artisanal economies complicate things. They build more nuanced relationships. The exchange carries value in several registers. Meaning often carries as much weight as value. There’s a deeper connection between seller and buyer, employer and employee, worker and work, enterprise and locality. In the case of Olives and Grace (see Project entry # 1), the consumer shops not just because s/he wants a certain product or service, but because s/he wants to live in a certain kind of neighborhood. This makes for an interesting calculation. “Wow, that’s a lot for a scented candle” becomes “hmm, how much do I want Sofi to flourish here?” And “What difference will her flourishing actually make to the neighborhood?” This is where we put on our Frank Capra glasses and look at the world with a Olives and Grace and without. There are also new complexities on the “Guyer side,” let’s call it. When is it okay to intervene with moral intent? When is this intrusive and presuming? These are judgment calls…and open questions… to which we will return.